Adjunct Professor in Youth Research (University of Tampere) and Senior researcher at the Finnish Youth Research Network (the FYRN) in Helsinki, Finland. She holds a PhD in Development Studies. She’s currently a member of Pool of European Youth Researchers (PEYR) in the youth partnership between the European Commission and the Council of Europe. Her multidisciplinary research has focused on young people, political engagements and democracy in multiple European, Mediterranean and global settings. She has earlier been member of research consortium that examined political processes and opportunities for engagement from the perspective of young people in Africa (2012-2016). It was a joint project of the Finnish Youth Research Network and University of Helsinki - first Development Studies, and from 1.1.2015 the Swedish School of Social Science (Sociology) - funded by the Academy of Finland (YoPo  Pl: E. Oinas). The consortium contributed with new knowledge on contemporary societal changes in contexts where the rapidly growing majority of population is young and questions of political participation, citizenship, livelihoods and frustrations require urgent attention. The study was carried out in five different African countries (Tunisia, Egypt, Somalia, Kenya, Zambia and South Africa) and in France (focusing on migration), using ethnographic methodologies. The cases reveal different aspects of what ‘politics’ may mean in unstable contexts: they differ in terms of state formation and democratic structures, post-conflict developments, NGO involvement, donor funding and global connections. Final product of the project was the open-access book What Politics? Youth and Political Engagement in Africa (Brill). Recently Laine was also involved as a university researcher in an ‘ERA.NET Plus with Russia’ -funded multi-disciplinary project Livingmemories: Living together with difficult memories and diverse identities funded by the Academy of Finland (1.10.2015-30.9.2017, IP: Kirsti Salmi-Niklander) that focused on different memories and diverse identities related with conflicts in Russia, Finland, Latvia, Estonia, Germany and Turkey. It addressed the questions: How can people live together after violent conflicts and with traumatic memories? How it is possible to allow difficult memories instead of silencing them? The project interrelated public acts of memory work to more private ways of remembering by applying multidisciplinary methodological frame. Project was coordinated by Kirsti Salmi-Niklander from the University of Helsinki, Faculty of Arts, Folklore Studies. Final book of the project is under evaluation. Laine and Salmi-Niklander also wrote together an open-access article from their pilot study "Volunteer work among asylum seekers and refugees in Finland from 2015 to 2017" (Gränslös, 2017). Post-doctoral researcher, 1.3.2012–31.9.2012, Children, Young People, Adults and Elderly People Evaluating Sport Places (IP: Anu Gretschel). Funded by Ministry of Education and Culture, Sport Unit. Accomplished in the Finnish Youth Research Network. Researcher, 1.9.2010–31.3.2012, situated at the office of the Finnish Youth Research Network, conducting PhD research. Scholarship funding from the University of Helsinki, Emil Aaltonen Foundation and Kone Foundation. Researcher, 1.8.2006–31.8.2010, Youth Work and Identities of Civic Action (IP: Tommi Hoikkala and Leena Suurpää). Finnish Youth Research Network. Finnish Youth Research Network & Finnish Ministry of Education and Culture. Coordinator, 1.8.2004–30.9.2005, Finnish Youth Research Society / Finnish Youth Research Network. Researcher, 15.11.2004–15.1.2005, Ethnographic fieldwork and research in Nicaragua for a non-fiction monograph Kahvin hinta – Kertomuksia nicaragualaisista kahvinviljelijöistä (Price of Coffee – Stories of Nicaraguan Coffee Farmers). Grant from the Committee for Public Information. Trainer, 1.2.-31.5.2015 Käpylän kubi, Helsinki. Three groups organised by local sport club (Käpylän Klubi) where I worked as a trainer/supervisor applying my knowledge of dance-movement therapy: 1) ”Heroes dance group” for 7-8-years old children; 2) “Creative movements group for girls and adults” and 3) “Authentic Movement Group”. Youth leader / dance-movement therapist, 1.9.2012-31.12.2014, Girls House, Helsinki. 7 person’s half-year long identity work groups where dance-movement therapy techniques were used (body-mind connection, improvising, and other creative methods). Researcher, 1.9.2011–31.8.2014, Nordic Network of African Childhood and Youth Research (NoNACYR [no. 40661, IP: Tatek Abebe]. NordForsk funded network project with 6 Danish, 7 Finnish, 6 Islandic, 11 Norwegian and 6 Swedish youth and childhood researchers. Invited guest commentator of the two key-note speakers in the opening plenary session of “Media education now” seminar: “Social media as a tool for new global social movements”. Helsinki, House of Sciences 10.11.2011. Invited guest lecturer: ‘Active Young Citizenships in the Nordic Countries’. The Youth Office of Barcelona Diputació, Annual Conference 7.5.2009, Sitges, Spain. ”Why active citizenship is important in current Finland?” 20-years celebration seminar of the Centre for International Mobility (CIMO), 8.6.2011. Kalastajatorppa, Helsinki. ”Five theses of children, youth and families as civic actors” 22.3.2011 Childrens and young people’s county in 2010’s. Final seminar of the policy programme for the well-being of children, youth and families. Savoy-theatre, Helsinki. I have also been interviewed as an expert by Finnish public broadcaster Yle to main morning radio news (10.2.2012), and to newspapers Huvudstadsbladet, Ylioppilaslehti, Keskisuomalainen and Finnish news agency Oy Suomen Tietotoimisto – Finska Notisbyrån Ab (STT-FNB) from where the news were published in several local newspapers. Facilitator 17.-19.3.2010 European Expert Meeting for youth workers: "Empowering youth work: Placing youth work in Europe as evidence based practice". The Netherlands Youth Institute and Foundation JONG Rotterdam. * Laine, Sofia (forthcoming 2015) Creating Agora Chronotopes on Young People's Political Participation in Transnational Meetings. In Carles Feixa & Carmen Leccardi & Pam Nilan (eds.) Spaces and Times of Youth Cultures in the Global City. Den Haag: Brill. * Laine, Sofia (2015) Embodied and moral methodological cosmopolitanism opposing rising neo-nationalism. Microanalytical perspective. In Pirkkoliisa Ahponen & Päivi Harinen & Ville-Samuli Haverinen (eds.) Dislocations of Civic Cultural Borderlines. Methodological Nationalism, Transnational Reality and Cosmopolitan Dreams. Springer, 71-85. * Jabberi, Fatma & Laine, Sofia (2015) Spaces of dialogue? The case of the World Social Forum Tunis 2013 from the perspective of young, local volunteers. Global Studies of Childhood 5(2): 178-190. * Laine, Sofia (2015) Mikropolitiikka, globaali toiminta ja kinesteettinen kenttä. Kanssatodistajana kahdessa vaihtoehtoisen globalisaation sosiaalisessa koreografiassa (Micropolitics, global action and kinaesthetic field. Co-performing in two social choreographies on alter globalization). In Anette Arlander & Helena Erkkilä & Taina Riikonen & Helena Saarikoski (eds.) Esitystutkimus (Performance studies). Helsinki: Partuuna, 83-112. * Laine, Sofia & Oinas, Elina & Suurpää, Leena & Levamo, Tiina-Maria & Onodera, Henri & Lavila, Piia & Rantama, Minna (2015) Polyphonic Ethos in Team Research: Lessons from the World Social Forum, Tunis 2013. In Airi-Alina Allaste & Katrin Tidenberg (eds.) "In search of..." New Methodological Approaches to Youth Research. Cambridge: Cambridge Publishing, 116–135. * Laine, Sofia (2013) Possibilities for Cosmopolitan Emancipation among Local Poor and Minority Youth in Transnational Political Events. Global Society 27(1): 73-90. Eskelinen, Teppo & Gellin, Maija & Gretschel, Anu & Junttila-Vitikka, Pirjo & Kiilakoski, Tomi & Kivijärvi, Antti & Koskinen, Sanna & Laine, Sofia & Lundbom, Pia & Nivala, Elina & Sutinen, Riikka (2012) Lapset ja nuoret kansalaistoimijoina (Children and youth as civic actors). In Anu Gretschel & Tomi Kiilakoski (eds.) Demokratiaoppitunti. Lasten ja nuorten kunta 2010-luvun alussa (Democracy lesson. Children’s and young people’s municipality in the beginning of 2010). Helsinki: Finnish Youth Research Network/Finnish Youth Research Society, publications 118, 213–248. Laine, Sofia & Merikivi, Jani (2011) Metodit (Methods). In Mirja Määttä & Tarja Tolonen (eds.) Annettu, otettu, itse tehty. Nuorten vapaa-aika tänään (Given, taken, self-done. Young people’s leisure time today). Helsinki: Finnish Youth Research Network/Finnish Youth Research Society, publications 112, 12–27. Kiilakoski, Tomi & Kivijärvi, Antti & Gretschel, Anu & Laine, Sofia & Merikivi, Jani (2011) Nuorten tilat (Youth spaces). In Mirja Määttä & Tarja Tolonen (eds.) Annettu, otettu, itse tehty. Nuorten vapaa-aika tänään (Given, taken, self-done. Young people’s leisure time today). Helsinki: Finnish Youth Research Network/Finnish Youth Research Society, publications 112, 57–91. Laine, Sofia & Gretschel, Anu & Siivonen, Katriina & Hirsjärvi, Irma & Myllyniemi, Sami (2011) Toiminnan motiivit (Motives of action). In Mirja Määttä & Tarja Tolonen (eds.) Annettu, otettu, itse tehty. Nuorten vapaa-aika tänään (Given, taken, self-done. Young people’s leisure time today). Helsinki: Finnish Youth Research Network/Finnish Youth Research Society, publications 112, 92–108. Gretschel, Anu & Laine, Sofia & Siivonen, Katriina & Peltola, Marja & Myllyniemi, Sami (2011) Toiminnan esteet (Obstacles to action). In Mirja Määttä & Tarja Tolonen (eds.) Annettu, otettu, itse tehty. Nuorten vapaa-aika tänään (Given, taken, self-done. Young people’s leisure time today). Helsinki: Finnish Youth Research Network/Finnish Youth Research Society, publications 112, 109–127. * Laine, Sofia (2009) Contestatory performative acts in the transnational political meetings. Societies Without Borders, 4(4): 398–429. * Laine, Sofia & Gretschel, Anu (2009) Whose arena is the EU youth policy? Young participants’ involvement and influence in the EU youth policy from their own points of view: case of the EU Presidency Youth Event in Hyvinkää, Finland. Young 17(2), 191–215. Laine, Sofia & Dorff, Jenni (2008) Nuorten käsityksiä poliittisesta vaikuttamisesta ja osallistumisesta – näkökulmina EU:n nuorisopolitiikka ja ydinaseiden vastainen toiminta (Young people’s concepts of political influence and participation – EU youth politics and anti-nuclear protests as perspectives). In Minna Autio & Kirsi Eräranta & Sami Myllyniemi (eds.) Polarisoituva nuoruus? (Polarized Youth?) Helsinki: Finnish Youth Research Network/Finnish Youth Research Society, publications 84 & Nuora & Stakes, 118–126. Laine, Sofia & Kangas, Ilka (2002) Aivokemiallisista häiriöistä elämänhallinnan vaikeuteen – Hyväosaisten nuorten aikuisten näkemyksiä omasta ja ikäryhmänsä pahoinvoinnista (From the brain chemical disturbances to the life-management difficulties - Fortunate young adults' opinions about their and their age group’s mental disorders). Nuorisotutkimus (Finnish Journal of Youth Research) 20(3), 18–31. Kiilakoski, Tomi & Laine, Sofia & Pulkkinen, Emma (2015) Eurooppalainen nuorisopolitiikka eilen ja tänään - Howard Williamsonin haastattelu (The European youth policy yesterday and today – Interview with Howard Williamson). Nuorisotutkimus (Finnish Journal of Youth Studies) 33(1), 55–65. Laine, Sofia (2014) Paikalliset liikkeet kasvattavat globaaliin toimijuuteen - Carmen Leccardin haastattelu (Local social movements will educate on the global agency – Interview with Carmen Leccardi). Nuorisotutkimus (Finnish Journal of Youth Studies) 32(1), 54–63. Laine, Sofia (2013) Haavoittuvuus on nuorison omaehtoisten ympäristöliikkeiden ytimessä - Geoffrey Pleyersin haastattelu (The vulnerability is at the heart of young people’s self-declared environmental movements – Interview with Geoffrey Pleyers). Nuorisotutkimus (Finnish Journal of Youth Studies) 31(3), 58–65. Laine, Sofia (2013) Suivaantuneiden keskiluokkaisten nuorten globaali aalto (Indignant middle-class young people’s global wave). Nuorisotutkimus (Finnish Journal of Youth Studies) 31(1), 86–92. Laine, Sofia (2011) Matkoja tutkijaäitien riittämättömyyden tunteeseen (Trips to researcher mothers’ feelings of inadequacy). Kirjat (Books). Sosiologia (Finnish Journal of Sociology) 48(3), 271–272. Levamo, Tiina-Maria & Laine, Sofia & Kotilainen, Sirkku & Mattila, Päivi & Onodera, Henri & Suoninen, Annikka (2010) Globaalia ulottuvuutta suomalaiseen nuorisotutkimukseen (Global dimension to Finnish youth studies). Nuorisotutkimus (Finnish Journal of Youth Studies) 28(2), 84–95. Laine, Sofia (2010) Lasten ja nuorten osallistuminen arkea koskeviin asioihin ja päätöksentekoon (The participation of children and young people on the affairs and decision-making concerning their everyday life). Arviot (Book Reviews). Nuorisotutkimus (Finnish Journal of Youth Studies) 28(3), 101–104. Levamo, Tiina-Maria & Laine, Sofia & Kotilainen, Sirkku & Mattila, Päivi & Onodera, Henri & Suoninen, Annikka (2010) Globaalia ulottuvuutta suomalaiseen nuorisotutkimukseen (More global perspective to the Finnish youth research). Katsaukset (Reviews). Nuorisotutkimus (Finnish Journal of Youth Studies) 28(2), 84–95. Laine, Sofia (2010) Kansainvälisillä poliittisilla kokouksilla on tutkijoille annettavaa (International political meetings have something to give for researchers). Keskustelua (Discussion). Tieteessä tapahtuu (Science Now Journal) 3, 44–45. Laine, Sofia (2008) Marianne Milmeister & Howard Williamson (eds), Dialogues and Networks. Organising exchanges between youth field actors. Luxemburg: Centre d’Etudes sur la Situation des Jeunes en Europe (CESIJE), 2006. Youth research monographs, Vol. 2, ScientiPHIc series. 210 pp. Books. Young 16:3, 345–348. Laine, Sofia (2006) Nuorten aikuisten salattu masennus. Yhteisöttömyyttä vai leimautumisen pelkoa? (Concealed depression among young adults. Disconnection from societiesor a fear of stigma?) In Anne Puuronen (ed. ): Terveystaju. Nuoret, politiikka ja käytäntö (Helath Literacy. Young people, politics and practice). The Finnish Youth Research Network / The Finnish Youth Research Society, 33–47. Laine, Sofia (2005) Differences in the help-seeking behaviour of depressed Finnish young adults with suicidal tendencies. In Tommi Hoikkala & Pekka Hakkarainen & Sofia Laine (eds.) Beyond Health Literacy – Youth Cultures, Prevention and Policy. Helsinki: The Finnish Youth Research Network / The Finnish Youth Research Society, publications 52 & Stakes, 121–136. Laine, Sofia (2005) Henkilökohtainen on globaalia – Reilu kauppa nuorisoaktivistien kriittisenä kannanottona talouden globalisaatioon (The personal is global - Fair Trade as a critical position of young activists in response to economic globalization). In Tommi Hoikkala & Sofia Laine & Jyrki Laine (eds. ): Mitä on tehtävä? Nuorison kapinan teoriaa ja käytäntöä (What Needs to Be Done? Theory and Practice of Youth Revolts). The Finnish Youth Research Network / The Finnish Youth Research Society, publications 51 & Loki-Kirjat, 289–312. Laine, Sofia (2005) Neljän naisministerin tarina aktivismista ja siitä mitä pitäisi tehdä. In Tommi Hoikkala & Sofia Laine & Jyrki Laine (eds. ): Mitä on tehtävä? Nuorison kapinan teoriaa ja käytäntöä (What Needs to Be Done? Theory and Practice of Youth Revolts). The Finnish Youth Research Network / The Finnish Youth Research Society, publications 51 & Loki-Kirjat, 151–176. * Laine, Sofia (2012) Young Actors in Transnational Agoras. 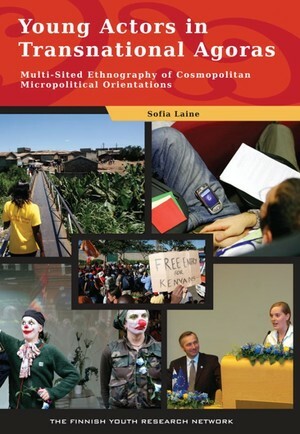 Multi-Sited Ethnography of Cosmopolitan Micropolitical Orientations. Helsinki: The Finnish Youth Research Network / The Finnish Youth Research Society, publications 121. Tommi Hoikkala & Pekka Hakkarainen & Sofia Laine (eds.) (2005) Beyond Health Literacy – Youth Cultures, Prevention and Policy. Finnish Youth Research Network/Finnish Youth Research Society, publications 52 & Stakes. Tommi Hoikkala & Sofia Laine & Jyrki Laine (eds.) (2005) Mitä on tehtävä? Nuorison kapinan teoriaa ja käytäntöä (What Needs to Be Done? Theory and Practice of Youth Revolts). Finnish Youth Research Network/Finnish Youth Research Society, publications 51 & Loki-Kirjat. Laine, Sofia & Ait Mous, Fadma & Boucherf, Kamel & Roberts, Ken & Saleh, Elizabeth (2015) SAHWA Background Paper BP02: Youth Political Engagement in Tunisia, Egypt, Algeria, Morocco and Lebanon. 8.6.2015. 6 articles in Nuorisotyö (Youth Work) Magazine, 2005-2013. Laine, Sofia (2012) Tunisialainen tyttö poliittisissa aika-tila-tihentymissä (Tunisian Girl in political time-space-chronotopes). Nuori voima: kulttuuriharrastajain lehti (Young power: culture enthusiasts journal) (5), 86. Laine, Sofia ja Karjalainen, Raisa Kyllikki (2006) Kahvin hinta. Kertomuksia nicaragualaisista kahvityöläisistä (Price of Coffee – Stories of Nicaraguan Coffee Farmers). Helsinki: Tammi. Laine, Sofia (2004) Puhuvat ja vaienneet. Nuorten aikuisten masennuksen sosiaalinen ilmeneminen (Those who speak and those who remain silent. Social appearance of young adults' depression). MA thesis, Department of Sociology, Faculty of Social Sciences, University of Helsinki. Laine, Sofia (2001) Miten sata norsua mahtuu kahvihyllyyn? Reilu kauppa esimerkkinä eettisestä kaupankäynnistä (How does a hundred elephants accommodate to the coffee shelf? Fair trade as an example of ethical trading). BA thesis, Department of Development Studies, Faculty of Social Sciences, University of Helsinki.